I think the Vadim Shipachyov story is the most recent turn of events recently. Three months ago, the Vegas Golden Knights gave him a contract with a big bonus and a $4.5 million cap hit, believing him to be the franchise's first No. 1 centre. Turns out, Cody Eakin is the team's first No. 1 centre, and Shipachyov didn't even make the team. That is such a strange turn of events. Were they make a horrible misjudgment three months ago, or a horrible one today? Either way, it's a fascinating story to follow. Here are the other stories on my mind these days. There's a new hashtag to follow on Twitter, thanks to Alex Novet (@AlexNovet). He, and others, are going to help people transition from Excel spreadsheets to R, which is a software tool that can help people do the same statistical work, but in half the time. However, there can be a bit of a learning curve for those without previous experience in coding. Also, Hayden (@3Hayden2) said he'll similarly help people with Python, but I'm not sure if there's a hashtag for that yet. It's really great when people spend the time to help build up the community, and help more people get involved, and get ahead. To learn even more about programming, be sure to attend the third annual Vancouver Hockey Analytics event, March 2-4, 2018. As you might know from following my blog, I've been playing around with defensive measurements lately (though not terribly seriously). To start my next model, I asked my Twitter followers for their subjective assessments of the best defensive defenseman in the game right now. Based on the top four suggestions, I put out the following poll, which surprisingly had Victor Hedman out front. Based on your replies, Lindholm, Karlsson, and Giordano were also viable choices for that poll. Then, Suter, Tanev, Keith, Ekholm. I plan to study these defensemen more carefully to see if I can figure out what makes them tick, and find a way to rate others on the same basis. Based on history, the first coaching vacancy should be coming up soon. Based on your suggestions, I chose the top four choices for the following poll, and apparently Dave Tippett is the most popular coach to take over mid-season (among veteran options, at least). Apparently, Michel Therrien was a dubious inclusion on the list. My bad! Which team has hit been hit worst by injuries? Based on the data compiled at @NHLInjuryViz, it looks like Anaheim, Boston, and Buffalo. Technically, Vegas hasn't been hit as hard, but they don't have any goalies! Fleury, Subban, and Dansk are all out, and Pickard was traded. They're using an AHL goalie named Max Lagace, and a 19-year-old named Ferguson to back him up. You'll notice my last blog post was about finding them an emergency solution. As for Buffalo, their blue line has been hit so hard by injuries that it looks like the following. I think this is why the letters O, M, and G were invented. I ran a poll, but sadly I neglected to include Boston in the list, which is a pity because I had a joke option in there. Nevertheless, Anaheim won this poll handily. Much was made of some recent glitches with NHL.com's latest statistical rollout, but don't ignore some of the great new stuff that may have been lost in the shuffle. First of all, they have a fantastic new glossary. Also, there is now a plus/minus breakdown all the way back to 1955-56. That means we know how many goals were scored (for and against) when a player was on the ice. That's very useful information, because it tells us who plays on special teams, and can help estimate how much ice time they had. There's also save percentage going back to 1955-56. I used the data to see how save percentages have changed over time, so that we can compare players across eras, and here's what I came up with. I also noticed in 1973-74 that Bernie Parent was .932, Tony Esposito was .929, and virtually nobody else was over .910. And, from 1993-94 to 1998-99, Hasek was .929, Roy and Brodeur were .915 and .914, and the league average was .902. Those are some dominant performances! Looking back at all this great historical data reminds me of one of the little hobby horses in the world of hockey analytics, to reduce the number of assists. The stat would be more meaningful if it only included legitimate assistance in scoring goals, and not just someone who chipped away a defensive zone breakout, or had some incidental contact that had nothing to do with the play. If we were to reduce the number of assists, what would be the most effective way? Most people think that it's just to allow only one assist per goal. Even if it's just someone leaving it behind the net for an end-to-end Bobby Orr, that is seen as the best way forward. I'm not sure I agree. I think I like option 3 the best. How about you? On November 5, I took a look at which players were out-performing and under-performing last year's scoring rate by the largest extent. Here are the results. In terms of those who have lost the most ice time, it's Kulikov and Enstrom on Winnipeg's blue line, the Sedins in Vancouver, Chris Kunitz in Tampa Bay, and Radek Faksa in Dallas. I had a poll suggested by one of my followers, on a particular game tactic. Feel free to reach out to me to suggest your own poll questions! There's a new book on the market, self-published just like my beloved Hockey Abstract. 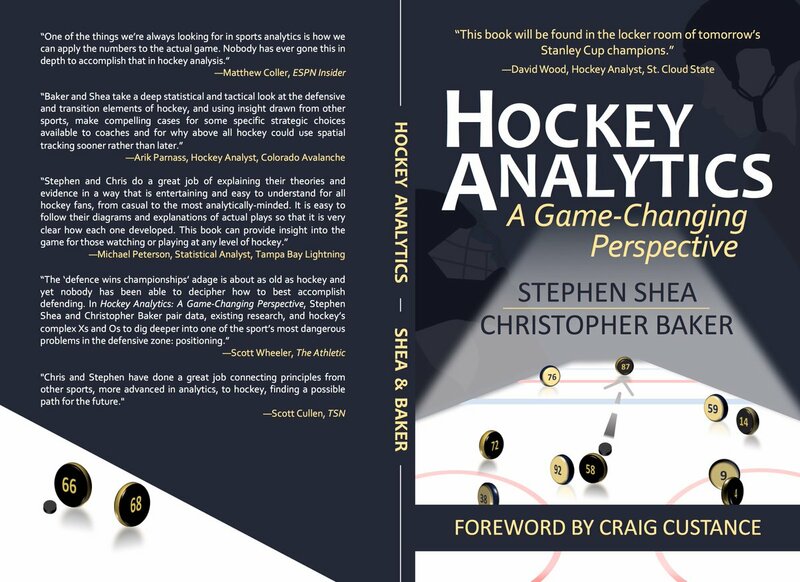 It's called Hockey Analytics, by Stephen Shea and Christopher Baker. It is great to see another book on the market, and I hope many others follow suit. It's a lot of hard work to write a book, and for very little reward. If anything, it just makes you a target for a lot of haters. Over the years, I've learned that very few people can even manage to write a chapter, so we really need to support the work that's out there. And, you may have heard that Sunny Mehta, who was one of the first public hirings in the field of hockey analytics (if not THE first) is no longer with the New Jersey Devils, as of last Sunday (h/t James Mirtle). I'm not sure what happened or what it means, but it's something to think about.